A trip to Stiff Chilli in Jalan Besar, Singapore, is a walk down Balinese memory lane. On the walls hang framed black and white memories of royalty and coy Balinese girls with sarongs around their waists, and not much else. Chef and proprietor Rodney Holt is passionate about preserving the history of Bali as he is with dishing out the best pasta. The Australian who worked as Italian chef with Aman Resorts and Hyatt Indonesia and F&B Director with Begawan Giri Resort loves culture and history, which may have something to do with meeting his wife AAA Putri Girindrawardani who descends from Bali royalty. Her grandfather, Ketut Ngurah Karangasem, was the last king to reside in the palace that’s at risk of ruin due to age and neglect. Australian swimming champion Michael Klim presents Bali Sports Personality of the Year to Rodney Holt for his achievements in Indonesian Rugby and the sporting scene in Bali in December 2007. Source: Stiff Chilli. 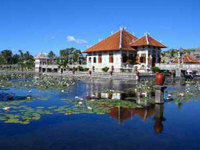 Puri Karangasem, home of the royal family of Karangasem, covers three palaces built by the last Raja in the early 20th century - Puri Agung, which is the main palace in town; Taman Ujung, the water palace; and Taman Tirtagangga, the water gardens. RJHgroup, owned mainly by Rodney, is helping Puri Karangasem in preserving the history both through video clips, oral history and digitizing of written records. “Right now, information about the history of the palace is written on palm leaves, which is not going to last. My concern is to record the information and digitize it, together with building a data of oral history from my father-in-law who has 5,000 books in a climate control room in the palace,” says Rodney. Puri Karangasem's rich history is under threat due to lack of conservation. Source: Stiff Chilli. With the restoration of books as well as old photos and yesteryear movies, Rodney hopes to preserve and display them in a museum that he intends to build within the palace grounds by end 2008. He adds that the project could do with added financial support through sponsorship. Rodney is quite an influencer in Bali sports. Starting as a participant in rugby and kite surfing when Stiff Chilli first set up shop in 1999, Rodney today sponsors and organizes events and meets such as Bali Sevens and International Rugby 10’s. He gets real busy, right down to supervising ticket sales, hauling up marquees and buying airfares for sports celebrities to attend the Bali Sports Gala. “I believe in karma - you give back what you take. The inaugural gala dinner with sports celebrities is an example of doing something big and good,” he adds. Rodney tells me how he took on an idle Balinese teen and showed him the finer points in kite surfing and encouraged him to excel in it. Eka Putu went on to taking the sport seriously and was so good at it that he impressed judges to win international kite surfing competitions four times over. Now 24, Putu is married and lives in Australia. Rodney cares for the environment too, which is why he supports the launch of a children’s book Penyu dan Lumba-lumba (Turtle and Dolphin). Written by Maggie Dunkler, the book is on environmental responsibility and keeping Bali’s beaches free from the plastic waste. “As the present generation has lost the focus on environment care, by teaching the kids at least we can influence the next generation,” he says. The book is also written in Balinese, which he hopes to be preserved, in addition to English and Indonesian. Organic products - Big Tree Bali and FairTrade products - are sold at Stiff Chilli (there are four outlets in Bali and one in Singapore), for preservation of the environment, health and taste. “My pasta sauce is made from vine-ripe tomatoes which taste better. Sorbet and gelata made from fresh fruit in Bali are pesticide free. We don’t use gums and stabiliziers in our ice cream – everything’s natural,” says Rodney. “In Singapore, only drink cans are collected by old people. No bins are provided to sort the rubbish, which is highly surprising for a developed country,” he says. Rodney tells me that there is a long way to go before Asians wake up to the need for environment conservation. 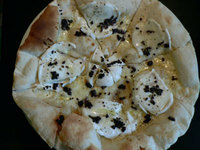 Maybe a trip to Stiff Chilli for a wholesome meal like my favourite juicy vegetarian lasagna and wood fired pizza with four cheeses, plus a slice of Balinese history may stir an awakening in us. Post-note: Sadly, the restaurant is no longer in operations. We will certainly miss Stiff Chilli in Singapore, but do trip along to Sanur, Bali to sample the pizza there where the chef is still at work.